If you have received a Juror Qualification Questionnaire, please read this section of the website carefully. The Questionnaire is not a summons for jury service. Those receiving Questionnaires to complete may or may not be randomly selected to receive a summons in the future. Every odd-numbered year, the United States District Court for the Northern District of Florida refills its jury wheels with names of potential qualified jurors. 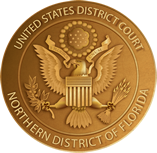 To begin this process, the Court mails Juror Qualification Questionnaires to potential federal jurors residing in the Northern District of Florida. Names are randomly selected from lists of registered voters for the counties that comprise the Northern District of Florida. During the next few months, the Court will process the completed Juror Qualification Questionnaires. It is imperative that your Questionnaire is completed truthfully and returned to the Court in a timely manner. From this process, the Court creates a pool of qualified jurors who may be randomly selected to serve on grand or petit juries in the Gainesville, Panama City, Pensacola, and Tallahassee Divisions of the federal court. Each month our Jury Staff uses an automated jury system to randomly choose several hundred names to summons as potential jurors. Log in to eJuror to complete your juror qualification questionnaire online.